Tree removal in North Shore area and New South Wales in general, is a service in constant need. Although at Tree King Tree Services we believe that cutting a tree should be a last resort, and we can assist in deciding whether a tree needs to be removed or not, in some cases the removal of the tree is required. Sometimes trees have to be removed due to poor health, being a threat to safety, poor aesthetics, or incorrect size for the space. Tree King Tree Services can remove any tree safely and efficiently no matter of the tree size, or location. In essence, to remove a tree, one of our climbers will climb the tree while removing the limbs from the bottom up, taking care to drop them carefully to a cleared area on the ground. If the tree is in close vicinity to a home, fence, or structure, we will rig each limb carefully down one at a time to the ground, stacking the limbs in a safe area out of harm’s way. Sometimes a crane or bucket truck is required to assist in removing a very difficult or risky located tree. Once we have all the limbs removed in a section of the tree to be removed, we’ll proceed to cut the trunk and safely lower it to the ground in the same fashion. 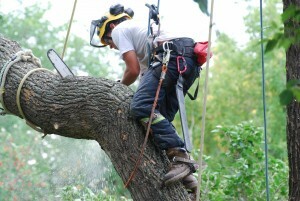 In this way, we can completely control the process of tree removal from top down. Sometimes, the tree is positioned in such a way where we’d need to utilize a crane to remove the tree safely, and North Shore Tree King Tree Services is up to the challenge. During a tree removal project, we will chip all the brush in our chipper and haul away the wood chips, or leave them on site if the client would like to use the chips as mulch. We also cut up all the large pieces and remove them, or cut them rounds for firewood for the client if they want it for their own use. In any event, we always take pride in leaving the site neat and clean upon the project’s completion. Contact us on 04 04 04 33 33 to process your trees into logs ready for the mill, or blocked and ready for the fireplace.